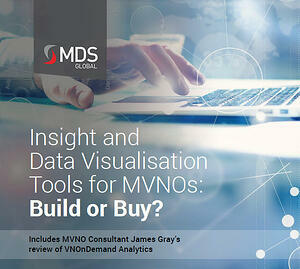 Insight and Data Visualisation Tools for MVNOs: Build or Buy? Analytics enable MVNOs to optimise every area of their business, from wholesale negotiation to customer retention. Without insight into their data, MVNOs are forced to fly blind, making decisions based on hunches and conventional wisdom, rather than real information. But having this information on a spreadsheet, or series of spreadsheets, is problematic - to really understand their data, MVNOs need to be able to visualise it. When looking to implement a data visualisation tool, MVNOs are faced with two options: build it in-house or buy a ready-made solution. In this whitepaper, we explain why using a ready-made data visualisation tool designed specifically for MVNOs, such as VNOnDemand Analytics, is the better choice. This whitepaper also features a product review by MVNO Consultant James Gray, who explains why VNOnDemand Analytics is essential for MVNOs that want to review performance and make adjustments in real-time, using true insight to steer their business. Complete the form to download this whitepaper.